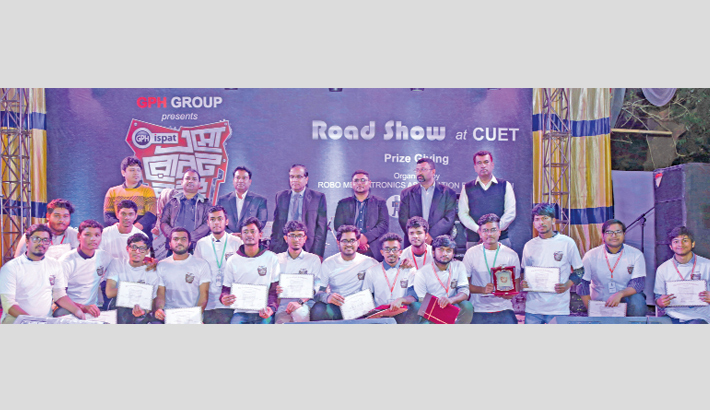 Chittagong University of Engineering and Technology (CUET) Vice Chancellor (VC) Professor Dr Rafiqul Alam said engineers will have to take ultramodern projects and implement them to materialise the mission and vision of the Prime Minister Sheikh Hasina. He said this while addressing as the chief guest at the prize giving ceremony of a road-show titled ‘GPH Ispat – Let’s Make Robot’ on the university campus on Monday. The CUET VC in his speech put up different activities being carried out at the university for developing robots. He said CUET Robo Mechatronics Association was formed around 12 years back and students from the university also participated in programmes in the USA. The role of GPH Ispat is laudable as they have been sponsoring such ultramodern activities since long, said the VC. GPH Ispat Additional Managing Director Almas Shimul said sustainable technology is a must for development of the country. GPH Ispat kept its efforts continued to encourage the talented students to stay in the country through resisting brain-draining, he said. The additional managing director also informed that his company is using the latest technology for expansion of a plant which is scheduled to go to production by middle of this year. CUET Professor Dr Kazi Delwar Hossain presided over the programme while Centre for Robotic Innovation and Development, USA Co-founder Mehedi Shams, Robo Mechatronics Moderator Professor Dr Abu Nahian, Student Welfare Affairs Director Dr Mashiul Hoque, GPH Ispat Media Adviser Ovik Osman and Deputy General Manager (Brand) Fazle Rabbi addressed the programme among others.